I’ve loved reading blog posts of my fellow renovators displaying beautiful Christmas decor over the last couple of weeks, I’d hoped to do a similar post entitled ‘It’s Begining To Look A Lot Like Christmas’, truth is, it IS Christmas and still looks a lot like a building site, with a tree and bunch of mistletoe thrown in for good measure. 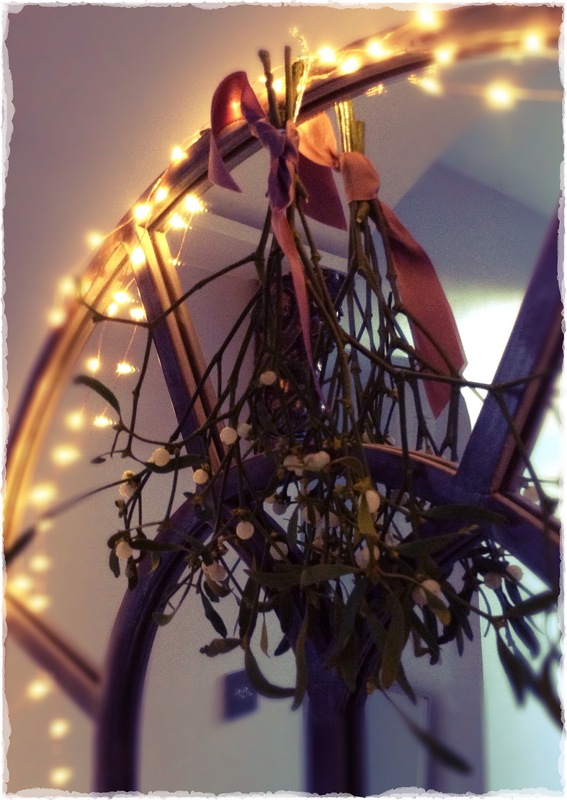 Top Tip: The florist advised yesterday that after Christmas I should hand the mistletoe in the attic and it will bring good luck to the house…who knew?! Frankly, I’m willing to try anything! After the door was stripped, we have an amazing entrance to the house (granted one needs to avert one’s eyes from the weeds and abandoned boxes in the front garden and perhaps clamber over a slab here and there…) but putting up the bauble wreath at the very least, was essential. I bought this beauty in Anthropologie in NYC maybe 10 years ago now… It must be an age as it was $68, which might buy you a lip balm in there these days! It was a nightmare to get home…a colleague had once advised me that whenever you see something travelling that you really want, you should take it, as the expense and inconvenience will be outweighed by the long-lasting regret of not having it. True that, and I therefore have ridiculous objects from all over the world. The wreath has hung in a variety of unsuitable places over the last decade but this is the first year it’s actually made pride of place on a front door. I love that the baubles pick out the window colours…I’ve always loved it, I just needed to find it the home it deserved. Tick! This entry was posted in Christmas Decor and tagged anthropologie, baubles, mistletoe by ladylansdowne. Bookmark the permalink. 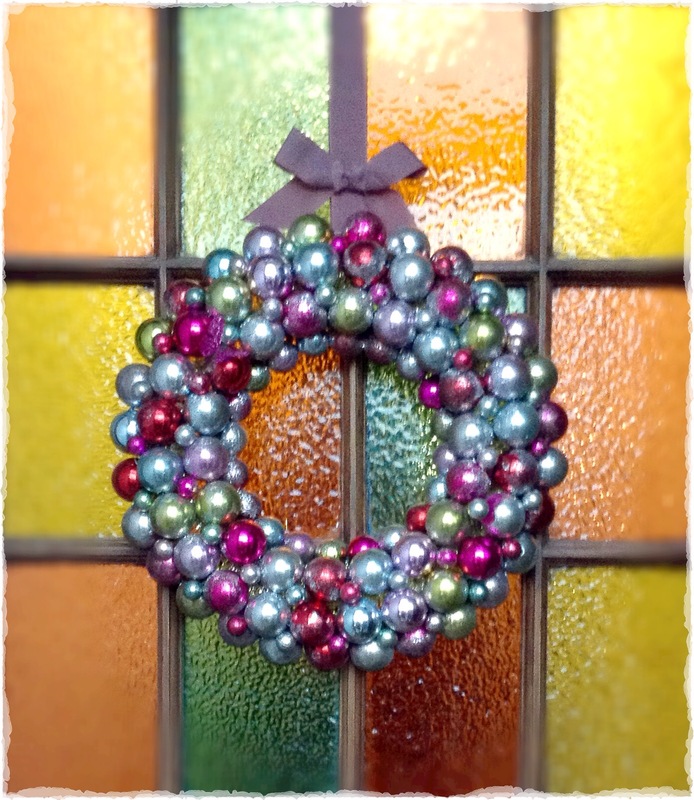 What a beautiful bauble wreath! Worth the trouble indeed :0)! Gorgeous wreath. Sometimes you’ve just got to go with your gut when you see something that catches your eye–the same goes for decorating, too! Thanks for the visit! Absolutely, if you love something, a room can build around it I think. I don’t see any weeds or abandoned boxes … only a beautiful wreath on a stunning front door! The colors are gorgeous together! Merry Christmas to you and your family!